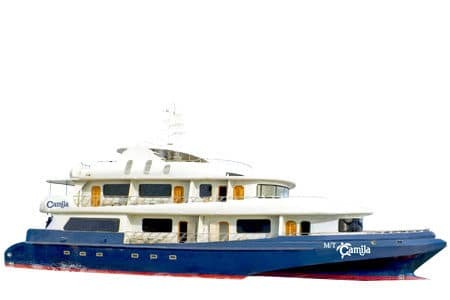 The Solaris Galapagos Yacht is scheduled to set sail in the first quarter of 2019, a stylish and modern vessel looking to bring unprecedented features in Galapagos cruising. The first cruise of its kind featuring 5 single cabins in a mid sized yacht, welcoming solo travelers and groups traveling in odd numbers. Going one step further, Solaris is also outfitted with 5 double cabins that can be converted to triples for families. Single supplement & cabin sharing are a thing of the past, a rare commodity to be found aboard a 16 passenger yacht. Solaris has some big shoes to fill in, as it will be taking over San Jose’s identical operation, a well known and versed cruise in the Archipelago. Solaris Galapagos Yacht has set expectations high, exquisitely designed for the discerning traveler, appealing to a large audience, be it single guests – to families, far reaching itineraries, and the addition of unique modern traits are sure to make it a compelling option for many. 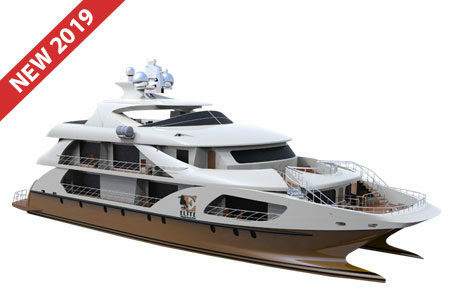 A sleek and well appointed twin hulled catamaran, the Elite Galapagos Catamaran will begin operation in summer of 2019. Part of the newest mega-catamarans cruising the Galapagos, the Elite will indulge your senses with exquisite social areas and close attention to detail, a seamless indoor and outdoor experience, with panoramic views at every turn. The Elite will feature all suite and premium golden suites, wall sized windows, private balconies, and enough legroom to relax after a day of exploring the unspoiled Galapagos islands. Dining areas and services include – buffet style meals served for breakfast and lunch, a semi covered sun deck for an al-fresco elegant sit-down dinner, snacks between meals, and professional chefs catering to any dietary needs. Far reaching itineraries, feature rich in wildlife and scenic landscapes will showcase the islands in short and long sails, ensuring all guests get to explore the islands at their own pace. Blurring the line with international standards for high end luxury, the Elite is assembled with modern safety equipment and state of the art navigational computers, yielding a reliable and worry free expedition. American made, Grand Majestic Galapagos Yacht is the only modern mega-yacht cruising the Archipelago. A combination of unique traits, outstanding service, and the fastest navigation will warrant an enriching experience for all guests aboard. Come aboard the sporty and elegant Grand Majestic to enjoy luxurious social areas, a Master Suite & panoramic windows for landscape indulgence. 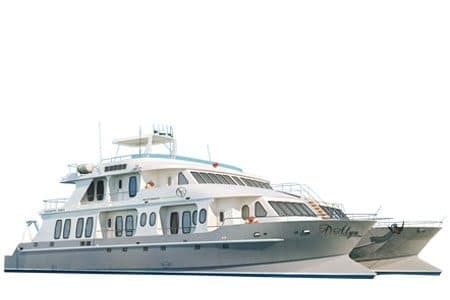 Specifically built to cruise the islands, the Grand Majestic Galapagos Yacht is ideal for private charters, the whole crew, captain and guide will be fully committed in providing unparalleled high quality service. Cabin layout is available throughout 2 separate decks for comfort and privacy. Finally, the Grand Majestic showcases the Galapagos in 3,4 & 7 night sailings. Far reaching itineraries featuring wildlife rich visit points, covering all corners in the archipelago. Introducing Camila Galapagos Trimaran. 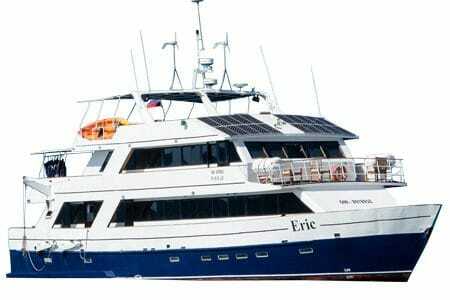 An all new top of the line vessel built to cruise the Galapagos. All 8 staterooms feature private balconies for wildlife and landscape indulgence. 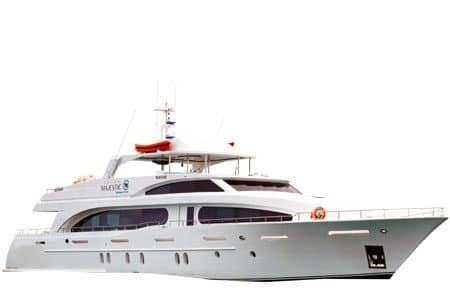 A spacious trimaran with rich inclusions to boast guests experience aboard. Inclusions vary from kayaks, snorkel & wet suit equipment, a Jacuzzi & much more! Camila Galapagos offers all inclusive four, five & 8 day programs. Comprehensive itineraries covering the most coveted corners & visit points in the Galapagos islands. Experience stunning volcano landscapes from the comfort of your private balcony. Other unique traits are the availability of a cruise manager, 10 crew members and bilingual naturalist guide, all looking after your needs for an outstanding experience. Most noteworthy, Camila Galapagos is the first trimaran to sail the Galapagos islands! 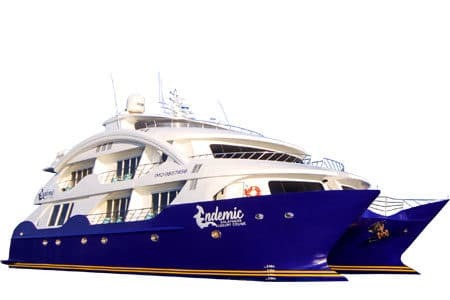 Piorly known as (Athala), the Celebrity Xploration Galapagos Catamaran is a luxury Catamaran built to excel in comfort and stability while cruising its passengers in the Archipelago. Every trait and feature aboard the Celebrity Xploration was designed to create an exclusive yet homelike atmosphere which will make your stay in paradise all the more enjoyable! With the best service possible in mind a cruise director is available at all times looking after guests needs. Facilities aboard the Celebrity Xploration Galapagos Catamaran feature interconnected cabins that have proven to be a great success among large families. 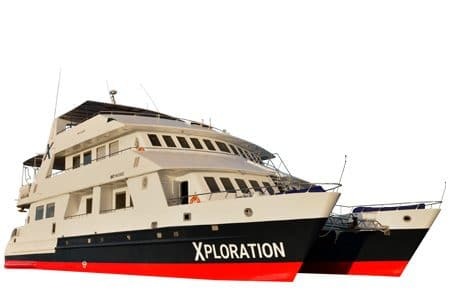 Private balconies for all cabins on main deck, a large solarium, all fresco dining, spacious lounge areas and buffet meals are all part of the many services the Xploration has in store for its guests. Itinerary offerings run for 8 days only, predominantly called after its stellar Islands (Espanola & Genovesa). The Alya Galapagos Catamaran will become available for voyages in 2017, a luxury catamaran built from the ground up to cruise the Galapagos Islands. Redefined comfort and cruising is reflected in every aspect of the experience for guest aboard. A customer-centric service, contemporary facilities and all inclusive comprehensive programs. 9 cabins welcome up to 16 guests, all featuring private balconies, air conditioned cabins, private bathrooms fully stocked with toiletries and hair dyer, high speaker and a safety deposit box. Social areas are available throughout the cruise for leisure and relaxation of guests. Spaces include a library, a media center, dining area, briefing area, bar and solarium. Itineraries provide guests with the perfect combination of activities showcasing hikes, snorkel, beach walks and kayaking. Top of the line guidance will walk guest through all the locations they visit and all wildlife they observe. 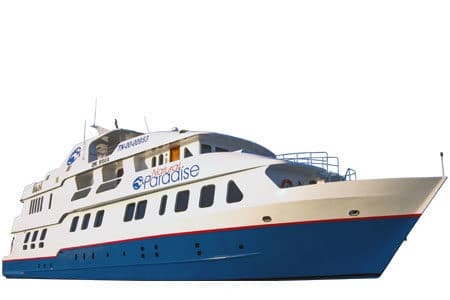 Introducing the Natural Paradise Galapagos Yacht, the latest addition to luxury cruises in the Galapagos islands. Customized to cruise 16 guest with the highest level of comfort, well appointed facilities, large suites and generous interiors sets the perfect atmosphere for unique encounters in the archipelago. The Natural paradise Galapagos yacht following its namesake, showcases the breathtaking landmarks and iconic islands in the Galapagos. Upper deck guests will appreciate the comfort of sightseeing stunning landscapes from the comfort of their private balconies. Other services include a Jacuzzi, exterior teak decks with al fresco dinning, a BBQ area, and comprehensive programs with a variation of lengths. 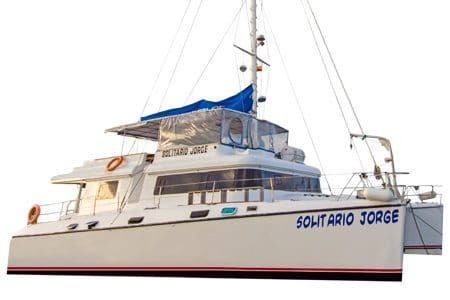 Fully renovated to cruise the islands, the Lonesome George Galapagos Catamaran, also known as Solitario Jorge – provides both naturalist and diving activities throughout its expeditions, a rare commodity among Galapagos vessels. Guest can partake in optional diving with up to 3 immersions per day. Complying with sustainable practices, the Lonesome George features a solar panel; making it an Eco friendly vessel. A crew of 8 plus guide will tend to all guest needs & comfort. Cabin arrangement is available with different layouts and can accommodate families in triples, couples in doubles or other guest in bunk beds. Common areas include a bar, briefing-lounge area, al-fresco dining, and sunbathing in the mesh bow. Itineraries A & B are available in their full 8 days length, or short 4 & 5 day programs that can be taken individually or combined for longer reach of the islands. Custom designed to cruise the Galapagos, Eric & Letty Galapagos Yachts are first class identical vessels accommodating up to 20 guest in 3 ample decks featuring shiny brass fittings. Essential elements that guarantee the perfect Galapagos encounter account for 7 night expeditions with daily briefings, guided excursions with expert naturalist guides, complimentary use of snorkel – wet suit equipment, and kayaking on open sea. 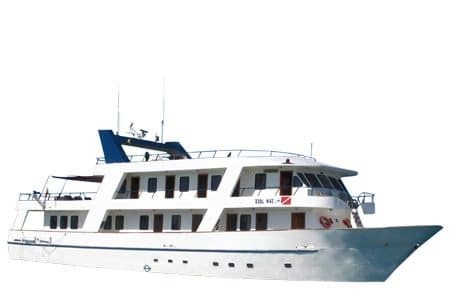 10 large staterooms with polished teak interiors are available in twin and double configurations, air conditioned and fully stocked with cabin amenities, private bathrooms and toiletries. Common areas include an open and shaded solarium with loungers, wildlife observation areas and a fully stocked bar and boutique.